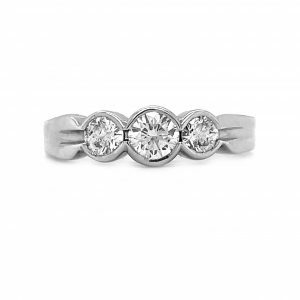 Hand crafted with great care and patience in our workshop in the centre of Dublin city, we put our hearts and souls into designing and creating our beautiful and original diamond rings. A destination for lovers from all over the world, we’re inspired by the romance and vitality of this incredible city, and that’s evident in our extensive range of stunning diamond rings. From the elegance of a beautiful single stone which seals the pact of a lifetime of love and commitment, to the opulence and luxury of a magnificent cluster with sapphires, emeralds or rubies, every one of our diamond rings is exquisite and unique. Using only the finest, ethically sourced diamonds and precious gemstones, which we select in person from the most reputable specialist merchants, our skilled jewellers share our passion for perfection, and whether simple or elaborate, our diamond rings are made to be cherished for a lifetime. Choosing might not be easy, because our diamond rings are available in a breathtaking choice of yellow gold, white gold or rose gold, with platinum as an option for the most exotic pieces, but we’re sure you’ll find the one that will crown your special moment.